Maiko Maya has been active in charitable work all of her life. She is the founder of The Circle of Charities Foundation, a non-profit organization which promotes local charities throughout the Los Angeles area. 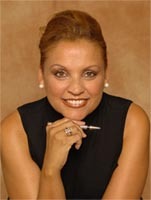 She is also the CEO of Circle of Charities LLC, a consulting company which raises money for the Charities in the Circle. She is part owner/VP of Harvelles, a live music venue located in Santa Monica and downtown Long Beach. Maiko spent her early childhood in Japan. As a teenager, she grew up in Santa Monica and Venice, and discovered that she was gifted in drawing, writing and music. She was very active with The Venice Arts Mecca in its early years and later, The Venice Dream Team, founded by Bingwa Thomas - which provided photography, art and acting workshops for kids living in the Venice area. Participants learned how to raise money with their photography, and by having their own art exhibits they earned enough to travel the world and take more photos. Maiko's interest in charitable work was sparked; she continued to find ways to help those in need. She was extremely curious about ways to help the homeless, and worked with groups of friends to sell items to raise money and buy food for some of the homeless people they became friends with at the park. Later, she would go on to develop relationships with organizations such as The Midnight Mission, The Union Rescue Mission, The SCLC, Forgiving For Living through her work with The Donald Sterling Foundation. Maiko Maya and The Circle of Charities works to promote 36 charities, mostly in The Los Angeles area and a few overseas. She lives in Los Angeles where she built a professional music studio to offer The Circle Arts Program, an arts program that provides free music lessons to kids who can't afford them. In exchange for the free art lessons, the kids learn about becoming little philanthropists and volunteerism by using their creative gifts to raise more money for The Circle Arts Program. Convergence is the lifeblood of the future. For over twenty-five years William Howard Fort AKA Jamaal Fort has applied his diverse talents to a number of industries. During the course of his career he has worked for a variety of companies committed to the advancement of the digital arts for both industry and entertainment. Throughout the nineties as a production designer art director and effects technician. Fort contributed to such notable projects as Judge Dredd, The Fifth Element and Dark City. He continued to refine his skills in service for Walt Disney Imagineering and Digital Domain. From 1994 to 2004 Fort served as the creative director for Virtual Reality Mariner, a division of the Seaman's Church Research Institute. During his tenure with Virtual Reality Mariner Fort participated in the development and creation of navigational simulators used in the training of river barge pilots throughout South America. Throughout the 2000's he has continued his work creating multimedia projects for foundations and entertainment clients. Fort currently serves as CEO of Access Media. A professional consultant and event manager for close to two decades, Wendy started with a concept for a single business that has matured into a conglomerate of companies known as Wendy's Enterprises. Wendy's ventures include: Personal Services Plus, a consulting firm assisting with community relations, strategic alliances and event management; Forgiving For Living, Inc., a nonprofit organization that offers solutions related to issues that require forgiveness; and the PLUS Awards, focusing on those that truly go above and beyond in the community helping others to be their best. Very active in the community, Wendy believes in giving back. She accomplishes her philanthropic quest through her nonprofit foundation, Forgiving for Living, Inc. Annually, the foundation hosts the PLUS Awards, honoring individuals committed to their communities in the areas of healing and forgiveness. For her own achievements and commitment to community, she has been the recipient of several honors, including the nationally recognized Curvations tribute presented by spokesperson, Queen Latifah in 2007. Greg White has always had a passion to help underserved young men and women in the areas of money and business. With this passion and more than 25 years of financial and business consulting experience, he founded The Probity Group, Inc. (TPG). TPG is a business coaching and mentoring firm focused on empowering student and professional athletes and entertainment professionals to achieve their personal best in money, business, and life - during and AFTER their sports and entertainment careers. Prior to forming TPG, Greg was a senior consultant with one of the top global management consulting firms, Watson Wyatt & Co. (now Towers Watson). He has also successfully served as the Vice President and for Seidensticker & Blake, a consulting firm specializing in human capital and financial management. Greg has worked with executives and managers in organizations such as Avery Dennison, PETCO, The Walt Disney Company, Dole Food Company, MetLife and The First American Corporation. He holds a B.A. in marketing from the University of St. Thomas in St. Paul, Minnesota. In addition to serving on the Advisory Board of the Circle of Charities Foundation, Greg was also an active member of USC's Corporate Advisory Board to the center for Management Communication Marshall School of Business, and Board of Directors of Junior Achievement of Southern California and The World is Just a Book Away Foundation. Greg has always enjoyed mentoring and working with youth as a coach in the Newport Beach Little League and Orange County Junior All American Football League associations. Cali T. Rossen was a High Honors graduate of the State University of New York, OCC, and Vice President of her Dental Hygiene class of 1992. While attending the University of N. Texas in 1998-99 to complete her Bachelor's degree, Cali was invited to join the Phi Beta Kappa Society. She was enrolled in theatre and art classes during this time, and was drawn to change directions and pursue a career in the arts. She began working with Executive Director, Maiko Maya on a benefit for Save the Children of Tibet, to raise funds for the completion of an orphanage in India. Cali is a California Ambassador for Save the Children of Tibet Project, and met with His Holiness the Dalai Lama on Earth Day 2012. Cali has become an artist of many dimensions, with a focus on performance, filmmaking, painting, and singing. She is an advocate for children of all ages pursuing their dreams. That is why Circle of Charities captured her attention. She is committed to assisting people in fulfilling their dreams, especially in the arts, as well as, being a diplomat for peace. Cali has been involved with many charitities: The Dream Reach Team, Chairwoman for Passion & Partnership events, OC107 Exchange Club Team, a Spokesperson for Charitable Endowment Support, Life Notes Edutainment, and is an Ambassador for Save the Children of Tibet Project. She knocks your lights ON!